The Samsung Galaxy S7 and S7 Edge are probably two of the most awaited smartphones of this year, and this is why everyone is constantly looking for rumors regarding its specs, features, release date and basically any information they can get their hands on. We are also eager to find out more about the smartphone that could be one of the flagship devices of this year, and whenever we find out something new, we like to let our readers know also. The probable launch date of the Samsung Galaxy S7 family, February 22, is fast approaching and we find out more and more about the devices with every leak. According to rumors, the design of the smartphone doesn’t differ much from the one of the Galaxy S6, so Samsung fans shouldn’t expect for a totally innovative smartphone to be unveiled next month. Even so, if you are a Samsung fan you probably won’t have anything against the existing design of the Galaxy S line, so the lack of imagination reflected by the design of the S7 will not affect your choice to purchase the device in any way. Even though the looks of the new S7 won’t change, there will be some serious changes going on under the hood. According to a spec sheet originating to Weibo it seems that the S7 will have a more powerful processor and more memory. 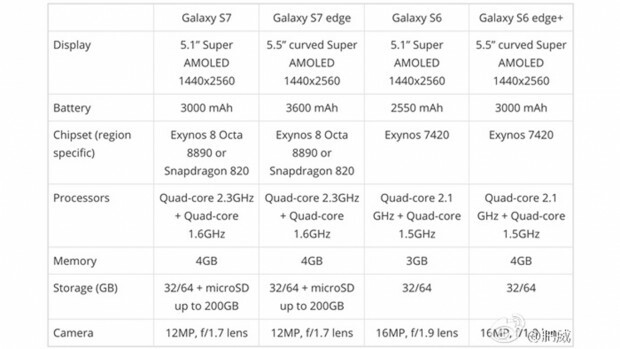 The Samsung Galaxy S7 and S7 Edge will most likely be powered by Samsung’s own Exynos 8 Octa 8890 or the brand new Snapdragon 820 chipset. As the matter of fact, it is thought that both chipsets will be present in the new S line devices, depending on the region they will be sold in. No matter which chipset will be sported by the smartphone, the next generation Samsung Galaxy S devices will have a processor with four cores clocked at 2.2GHz and four clocked at 1.66GHz. The smartphone will include 4GB of RAM and 32GB or 64GB internal storage, so the devices will definitely be powerful, fast, and efficient. One great news is that we will see the SD card slot return to the Samsung flagships, so in case users will need more storage than the 32 or 64GB the devices have to offer, they will be able to further extend the storage of the smartphones by up to 200GB. The latest rumors indicate a 5.1-inch super AMOLED display for the Samsung Galaxy S7 and a 5.5-inch curved display for the S7 Edge. Both displays will have the same 1440 x 2560 pixels resolution, which is also seen in the current versions of the Samsung Galaxy S family. This means that the next generation flagship devices will have the same stunningly clear and sharp screens as the Samsung Galaxy S6, S6 Edge, and S6 Edge Plus. The batteries also seem to get a boost. According to the latest news, the Galaxy S7 will be equipped with a 3000mAh battery and the Galaxy S7 Edge could have a more impressive 3600mAh battery under the hood. The camera, on the other hand, seems to have been replaced by a slightly worse one. The Galaxy S6 had a 16MP back snapper with f/1.9 aperture while the next generation smartphones will be equipped with a 12MP, f/1.7 camera. Although on paper it looks like a major change to the worse, it actually won’t be noticed by the majority of users, and the new camera will still be able to capture amazing photos. The smartphone will definitely run on Google’s latest version of the Android operating system, the Android Marshmallow, out of the box, so users will be able to enjoy every new feature of the software on a brand new, powerful smartphone. It was said that the new Galaxy S7 and the S7 Edge will be unveiled at the Mobile World Congress which will take place in Barcelona, Spain between February 22 and 25, so we will only have to wait another few weeks until we will know for sure what the new Samsung flagships will have to offer. As far as pricing goes, it was said that the 2016 flagships would probably cost less than the devices that were released last year, so we could see the price of the Samsung Galaxy S7 to start from somewhere around £550.